It appears that some marine mammals are certainly welcoming the presence of offshore wind farms. Satellite tags on grey and harbor seals reveal that these apex predators are frequenting two offshore wind farms in the North Sea to forage for prey. According to a study recently published in Current Biology, 11 seals showed evidence of foraging at the Alpha Ventus wind farm off Germany and the Sheringham Shoal wind farm off the United Kingdom, moving in a grid-like pattern as they swam from turbine to turbine. "We could actually pinpoint where the wind turbines were by looking at the paths the seals traveled," lead study author Deborah Russell told Live Science. "This is the first time marine mammals have shown use of these artificial structures for foraging." The fact that the seals were repeatedly searching within a restricted area at reduced speed clued scientists into the fact that the seals were foraging-indicating that these anthropogenic structures are also acting as artificial reefs. Movement patterns also revealed that some grey and harbor seals followed subsea pipelines near the turbines in search of food. 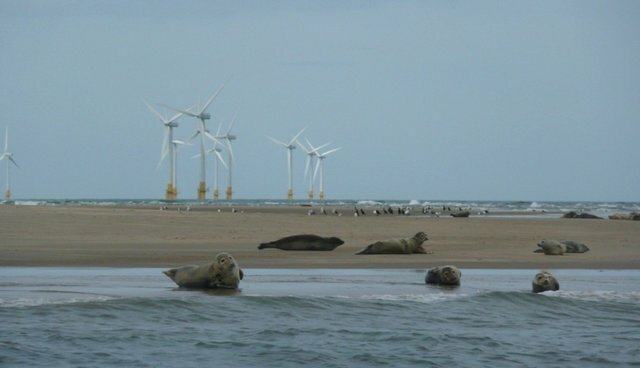 Visitors to these turbines included adults and juveniles as well as both male and female seals. Though seals did forage around these turbines, they represent a small portion of this satellite tagged population. Because these turbines are relatively new, the presence of seals and other apex predators may increase with time, say the authors. Since this study is the first of its kind, it raises ecological questions about the presence of such structures. The scientists aren't sure if wind turbines are actually causing prey sources to increase, or if they're just concentrating prey in a specific area. As the renewable energy industry grows, the scientists suggest that their design account for ecological implications.